Once every decade or so, a game comes along that becomes more than just a game, more than just a franchise, and evolves into a genuine cultural phenomenon. In the 70s it was Space Invaders, in the 80s it was Super Mario Bros and Tetris. The 90s and noughties brought us Pokemon and Halo. If you had to choose one title that broke out of the relatively niche world of gaming over the past decade, it would have to be Minecraft. Unless you've been living under a rock (or should that be block?) somewhere, you'll probably know about it. Even if you've never played it, you'll have seen the cuboid characters and trademark pixelated art style on everything from toys to t-shirts. Minecraft is designed with creativity at its core, allowing players to build their own objects, structures – even entire worlds out of 3D textured blocks in a procedurally-generated environment. It actively encourages co-operation and collaboration, allowing thousands of players to work together on group projects, or team up to battle enemies and the elements in Survival mode. Its open-ended, sandbox structure means that there's no beginning or end to the game, and players are limited only by their own imaginations. After selling 130 million copies to date, its already the world's second biggest selling video game (behind only Tetris), of all time. it wasn't much of a surprise when tech behemoth Microsoft decided to acquire the rights to the intellectual property from visionary developer Markus “Notch” Persson in September 2014. What was surprising was the price; a whopping $US2.5 billion ($NZ3.4b) making it not only the biggest gaming buy-out of all time, but one of the technology industry's largest ever acquisitions. 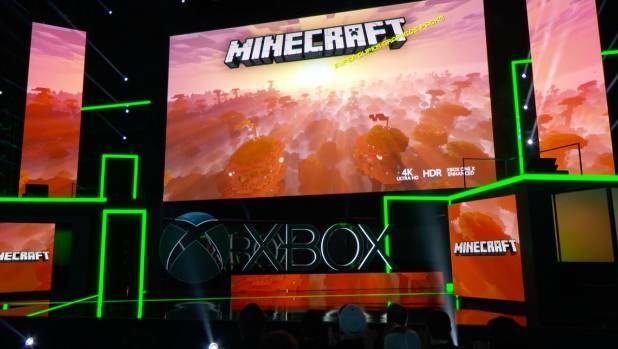 The future of Minecraft was one of the key focuses of Xbox's E3 showcase in Los Angeles last month. After spending that kind of cash on a single game, everybody expected Microsoft to have big plans for Minecraft. The most obvious move would have been to make the game an Xbox and Windows exclusive, but interestingly, the company decided to go in the opposite direction, focusing their efforts on releasing a version of it on practically every format known to mankind. Seriously, if you own a device that's capable of running a video game, there will almost certainly be an adaptation of Minecraft for it. It's on everything from Android phones to Apple TV. Microsoft's strategy seemed to be proliferation rather than progression, choosing not to mess with a winning formula or release a guaranteed smash hit sequel, but instead to spread the Minecraft seed as far and wide as possible. This business model made a lot more sense when, at last month's E3 gaming conference in Los Angeles, Xbox chief Phil Spencer unveiled the company's grand plan for the the future of the world's most popular video game. 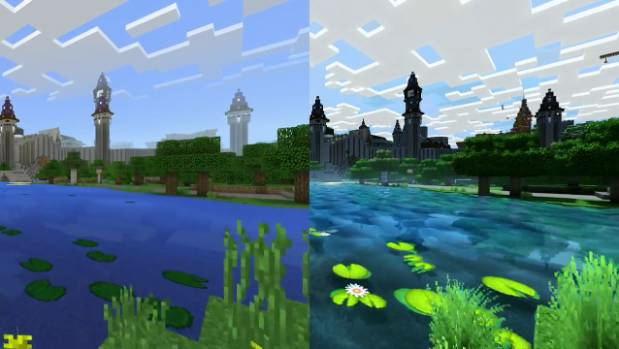 The first revelation was that the game was to undergo a complete visual overhaul, which, in typical Minecraft fashion, is to be called the “super-duper graphics pack”. Ostensibly, this was to take advantage of the new Xbox One X's 4K GPU, but for a game that has always been deliberately lo-fi and retro in terms of its art style, it did seem like a strange decision to render all these pixelated cubes in Ultra HD. On closer inspection though, it's clear that the update is more about visual effects than the graphical assets themselves. While the game retains its trademark pixelart style, it's the world around it that has been given a new lick of paint..
A side-by-side comparison of how Minecraft looks now, and how it will appear once the new graphics pack is installed. Dynamic shadows created by Minecraft's new directional lighting system means that what you see is constantly changing as you move through the world, and the appearance of your constructions will vary depending on where your character is standing and the position of the sun or other light sources. The addition of HDR gives deep blacks and bright colours a noticeable “pop” factor. Edge highlighting creates clearer, more defined boundaries between individual blocks and a completely revamped water system means that rivers, lakes and streams look more lifelike than ever before. Of course, you'll need a 4K monitor to get the most out of this graphical overhaul, but there's more than enough here to ensure that even gamers using standard 1080p TVs will see the benefit. Perhaps the most exciting revelation however, was that Minecraft would be going cross-platform. 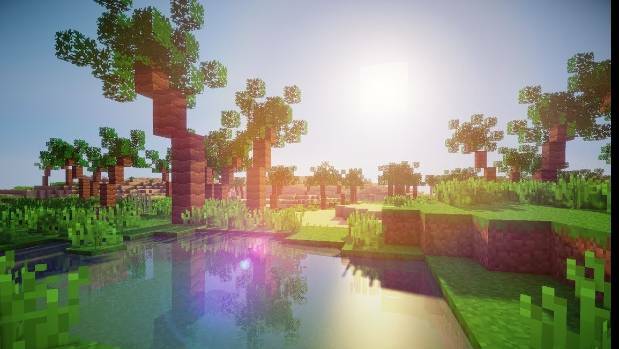 Up until now, players have been restricted to teaming up with friends on the same system, meaning the millions of Minecraft gamers around the world have been pigeon-holed and walled off into small, if thriving, communities. The decision to tear down these walls and bring everyone together on one unified server is a literal game changer. In a world where everything is about teamwork and co-operation, making it possible for an iPhone user to work with a friend on Xbox or join a grand-scale collaborative construction job on PC means that things are going to get bigger and better. There's a lot of potential in this strength in numbers strategy. In one fell swoop, Microsoft and Mojang have created one of the world's biggest gaming communities. 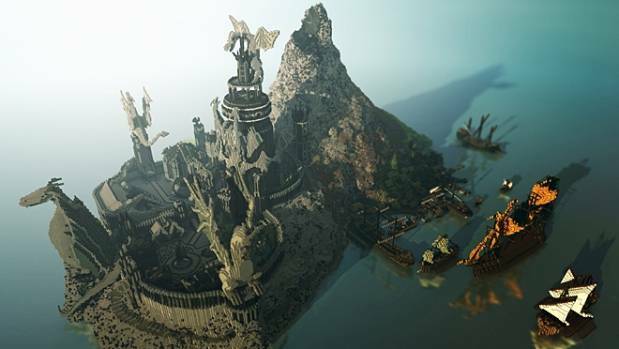 Large-scale collaborative projects have seen the creation of sprawling worlds in Minecraft, including a full reproduction of the land of Westeros from TV's Game of Thrones. Minecraft is already being used in schools as an educational tool and the fact that kids will now be able to hop on their phones at home to continue working on a project they started on their school computer network means that “homework” is going to be a much easier sell for teachers. Unfortunately, the cross-platform plan won't include every single format. Sony, Microsoft's main rival in this generation's console wars, has refused to come to the party, meaning that PlayStation users won't be joining in just yet. However, if the Minecraft phenomenon continues to grow at its current rate, you have to wonder if they'll reconsider and get involved if things start to snowball.